Powerful language, except in California extreme warnings are old hat. 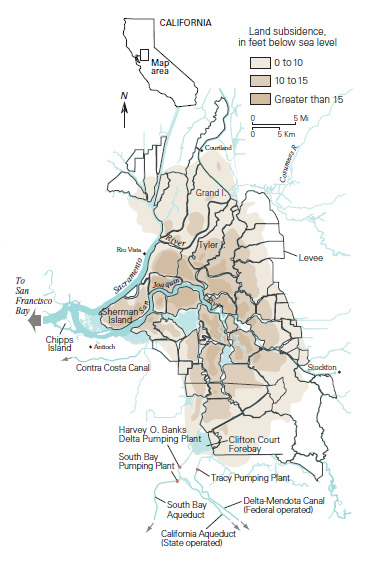 Delta levees have been crumbling for a quarter of a century, and repeated alerts to the clear and present danger, such as the USGS subsidence map, left, have not broken the deadlock between legislators representing fisheries, Delta residents, Central Valley farmers, and Southern Californian cities over how to manage the largest estuary on the Pacific coast of the US. Latterly, a governor top-loading delta fixes with demands for $3bn worth of new dams has only deepened divides. But the democratic senator from Sacramento has staked his political reputation that this year is different. Steinberg swears that this legislature will break the impasse. For past coverage of the bill-making process during regular session, click here, here and here. This post, which follows the special session called to break the impasse over the delta, has been refreshed from an item put up last week. That had to be deleted because of technical difficulties. This refreshed post will follow Steinberg’s progress with occasional updates. For the most recent breaking news, go to Aquafornia, the news-feed of the Water Education Foundation. UPDATE 10/29/2009: And there’s not enough money, according to the Contra Costa Times. Moreover, the Republicans have dug in over new dams, $3bn worth. For reaction from Restore the Delta, click here. Meanwhile, the Riverside Press Enterprise reports that elsewhere in the bills being circulated, the call for 20% conservation by 2020 worries water managers from the hotter, inland counties of Southern California. “We’re in a semi-arid desert and a park here is going to take a little more water than if you’re in Santa Monica,” said Randy Van Gelder, general manager of the San Bernardino Valley Municipal Water District. For Senator Steinberg’s draft bill, click here. For the rival bill from Senator Cogdill, here. UPDATE 10/30/2009 From WaterWired, Lloyd G. Carter, former UPI and Fresno Bee reporter long familiar with the agri-giants who control Westlands Water District, has a highly informative presentation, “California’s Water Mess: Is anyone doing anything right?” To watch it, click here. For video from 10/28/2009 hearings, here. From Carl Pope of the Sierra Club in the Huffington Post: The California legislature is poised, it appears, to pass a new bond act that will finance changes in the state’s water system. The combination of an outmoded system, mismanagement of basic ecosystems, climate change, and the current drought have created what The Economist describes as “an economic and political crisis.” Now, advocates of the new package (which the Sierra Club opposes), including my old friend Phil Isenberg, say it is “a marvelous achievement.” Sadly, I must disagree. Looking at the big picture, we are still headed for disaster — and to understand why, we need to go back almost 40 years. From the Contra Costa Times: … the state will ask state taxpayers to approve a $9.4 billion bond for new dams, regional water projects and ecosystem restoration. Many critics contend it fairer, for example, to link repayment to water use so farm districts and cities that benefit from the dams would pay for them. Specifically, the bond bill’s supporters want the money for dams that include Temperance Flat on the San Joaquin River; the Sites Reservoir, which would store Sacramento River water north of Sacramento; and an expansion of Los Vaqueros Reservoir, owned by the Contra Costa Water District. UPDATE 11/2/2009 From the Sacramento Bee via Aquafornia: Before adjourning shortly after midnight, the state Senate approved bills that would change the way the Sacramento-San Joaquin River Deltais managed; set ambitious new statewide goals for water conservation, and ask voters next year to approve a $9.99 billion bond package that would pay for water-related projects ranging from dams to recycling. Two other bills, which would require local water agencies to monitor underground water levels and increase penalties for illegal water diversions, fell just short of approval. Except for the bond measure, all of the bills are “co-joined,” which means they all must be approved for any of them to take effect. But Senate President Darrell Steinberg, D-Sacramento, predicted he would have the votes today to push them through. 11/4/2009 To hear a KQED forum explain the water legislation at 9am, click here. That Aquafornia, the source for Californian water news as it breaks.